Posted: August 3, 2018 in Obscurities, Who,What,Where & When...? John Sherwood was a rather talented Australian- an elite road racer, competitor in the 1938 Australian Grand Prix and winner of the 1939 New South Wales Grand Prix/Motor Road Race, both events at Bathurst. He was also an excellent Midget speedway racer, motor sport administrator and promoter. I was researching an article on Sydney’s Parramatta Park road circuit when I tripped over this article written by Sherwood in 1953. I’ve reproduced it for its rarity- a man of the sport, in the sport and involved in the business of racing writing about its history in period having participated in many of the events he describes. The selection of photographs to help bring the article to life are my own, otherwise Sherwood’s work is reproduced verbatim. ‘Generally speaking, history tends to be on the dry side, but fortunately the historical side of motor racing is anything but dry. It is rather fascinating to look back along the years to see how the sport in Australia has developed. Motor racing in our country has grown over the years despite several retarding factors: the continued objection of officialdom to all aspects of organised fast driving, for many years the impossibility of obtaining suitable circuits and tracks on which to race and the lack of factory support for ambitious and worthy drivers. Nevertheless, motor racing enthusiasts throughout Australia have overcome all these drawbacks, and today (1953 remember) we see more of the sport than ever before. Motor racing in Australia developed in Australia through the early reliability trials of 45 years ago, followed gradually by the inclusion in such trials of speed events such as hillclimbs, acceleration tests and short timed events over quarter and half mile distances. Then commenced the various city to city record attempts, for a long time unhindered by officialdom, in which usually big engined chassis with bucket seats, and a host of spare tyres sped from capital to capital over atrocious roads with the success of the run always influenced by the number of blowouts of the cord beaded edge tyres, and the number of tyres it was possible to carry on the vehicle. Drivers of these cars were considered super-drivers, and such men as the late AV Turner (later killed in a hillclimb), the late Boyd Edkins and ‘Wizard’ Smith were hero-worshipped everywhere by motor enthusiasts. ‘The early drivers were keen, and more tracks were opened at Penrith (one mile) Maroubra (5/6 mile highly banked concrete track) and beaches at Gerringong and in Victoria came into use for racing purposes. 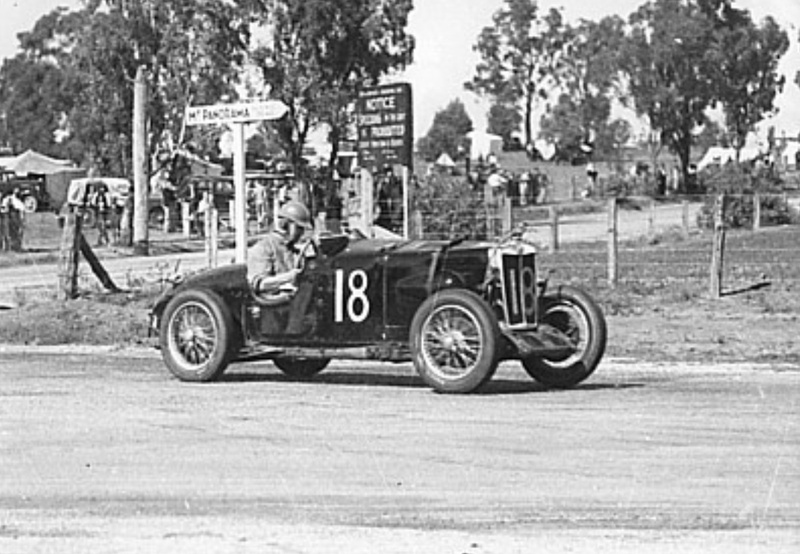 At Gerringong, Don Harkness, driving an enormous Minerva engined chassis, was clocked at 107 mph to be the first in Australia to exceed the coveted ‘century’. 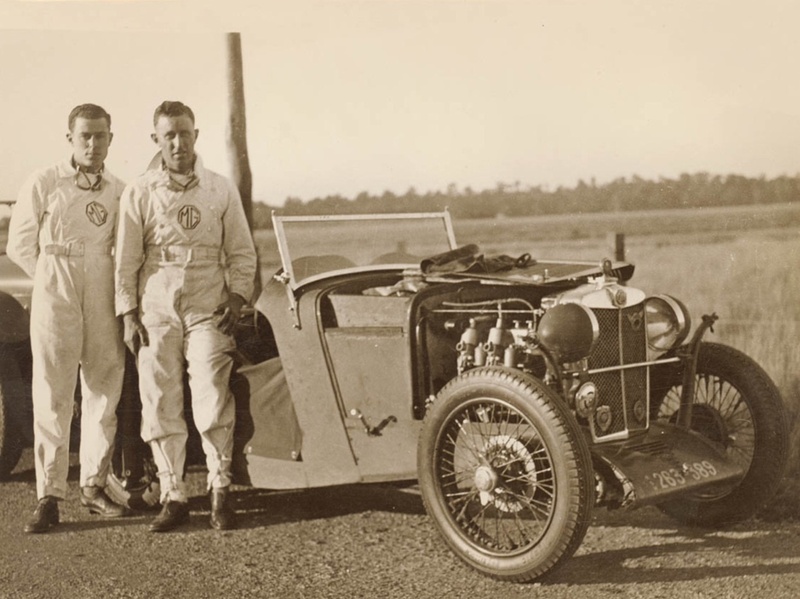 (The) First actual road racing circuit was opened at Phillip Island in Westernport Bay, 40 miles from Melbourne in 1928 and this became the mecca for motor racing enthusiasts for the next nine or ten years. At this point the dry bed of Lake Perkollili in Western Australia was the centre of motor racing in the west. 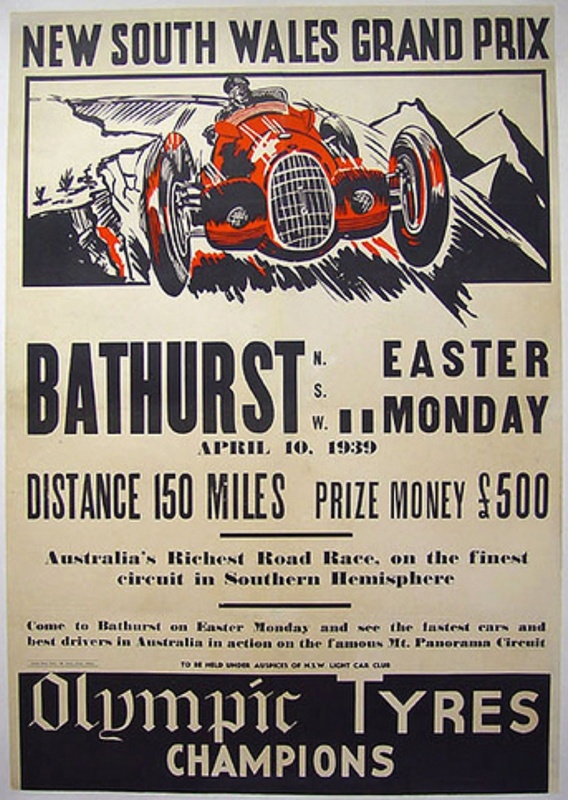 Australia’s best road circuit (more or less built specially for the purpose) at Mount Panorama, Bathurst came into being in 1938, and except for most of the war years, has been in use ever since. 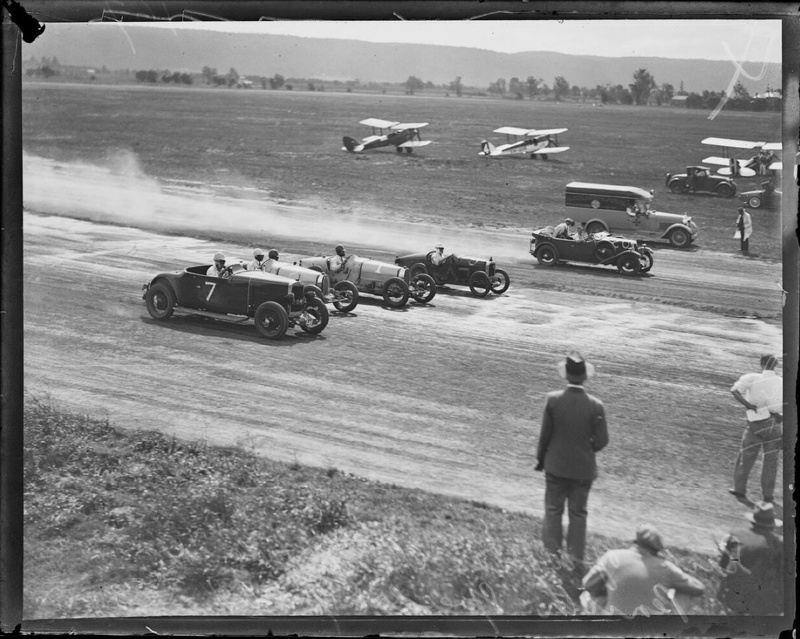 Other road circuits in other states have also sprung up, and since the war various ex-airforce strips have been adapted for racing with much success. The newest circuit to come into use is in Parramatta Park, 15 miles from Sydney, a rather narrow 2 mile circuit, suitable mainly for the smaller cars, but by reason of its close proximity to a big population, is certain of success. Down through the years cars have altered very considerably, the small high revving high compression engines now putting out power which one could not have conceived in the early days. Suspensions, brakes, steering, weight, tyres, fuel, streamlining and a hundred and one other things have combined to make the modern racing car a real thoroughbred, capable of sustaining terrific speeds over long distances. 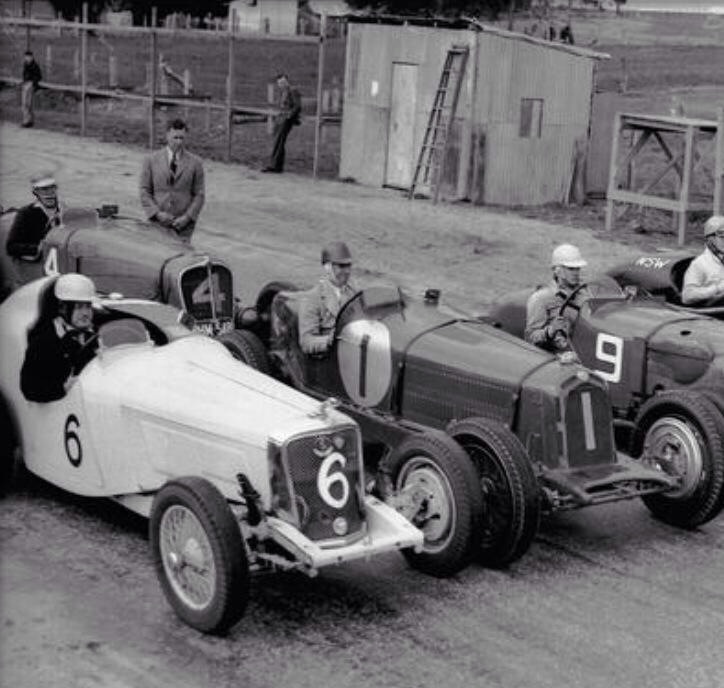 John Sherwood standing beside John Snow’s #4 Delahaye 135S, with the #6 Edison Waters Jaguar 100SS, Alf Barrett’s Alfa Monza and John Barraclough driven Alvis Terraplane straight-8 on the Bathurst grid in October 1939. Sherwood instrumental in the construction of this Australian racing institution- in the words of John Medley ‘Bathurst: Cradle of Australian Motor Racing’.